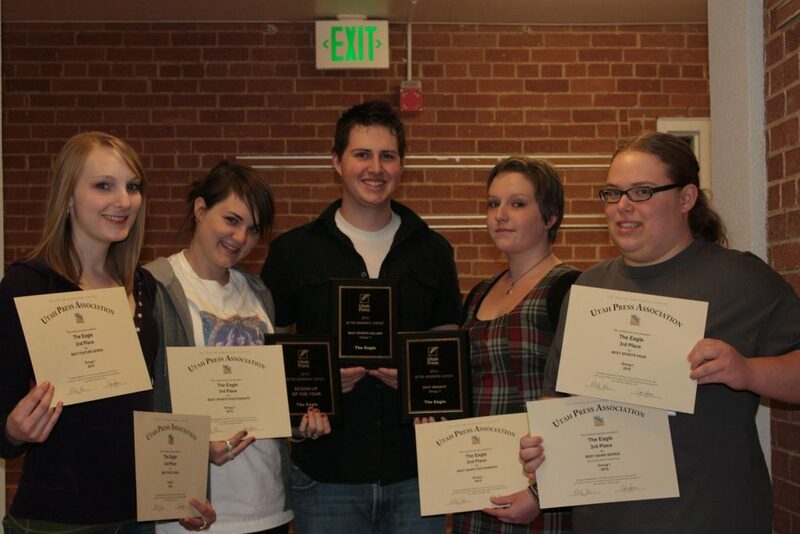 As USU-CEU’s Eagle newspaper was officially inducted into the Utah Press Association this past year, its presence was felt immediately when the newspaper earned three first-place awards, three second-place awards and three third-place awards Saturday at the press association’s annual convention in St. George. Eagle Sports Editor David Osborn Jr. won first place for Best Sports Column for his “Next on the Tee” series. Second place went to the Emery County Progress’ Gary Arrington for his “Sports Stuff” columns. The Eagle won the Best Website Design created by Les Bowen, former Eagle editor. The Emery County Progress won second. The final first place award brought mixed emotions to the staff. But, heck, a first place plaque is worth its weight in gold, right. The Eagle staff won Screw Up of the Year for the photo of a USU-CEU student in a black T-shirt with the words “I have a Ph.D. ” printed on the front as he ate in the cafeteria. The Eagle’s Homecoming photo page brought the staff a second place finish in the Best Photo Page category with Mt. Pleasant’s The Pyramid earning third and Sanpete Messenger earning first. In the Best News Photograph division, The Eagle won second place for Scott Frederick’s team photo of the men’s basketball team winning the SWAC championship with the heading “45-year drought ends.” Funeral photos of a fallen coach and a veteran won first for Tremonton’s The Leader and third for the Sanpete Messenger. Eagle photographer, Jessa Love Adams, won third place for Best Sports Photograph for a volleyball photo. The Leader took second and third place for a football and basketball photo. The USU-CEU Eagle staff won third place for Best Sports Page for their SWAC conference pages. The Manti Pyramid won first and Sanpete Messenger won second place in this category. “The best part about winning any award in the UPA contest, is that USU-CEU students compete against professionals in the journalism field. Kudos to The Eagle staff,” adviser Susan Polster, Ph.D., said. The newspaper was judged on issues from spring 2010 with Erin Page serving as editor; and fall 2010 with Kelli Burke-Gabossi and Mae Goss serving as editors. The Eagle was judged in group one of the four newspaper categories that includes all weeklies. The dailies are judged in the fifth category. Group one includes newspapers up to 2,500 in circulation. The college newspapers that are part of UPA include Utah Valley University, Brigham Young University, University of Utah, Weber State University, Utah State University and USU-CEU. The Eagle staff thanks Rick Shaw, publisher of the Price Sun Advocate, for sponsoring the newspaper and paying the fees to be part of the Utah Press Association. Without Shaw, The Eagle staff could not have been a part of such an incredible, professional organization.